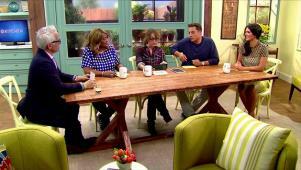 The hosts of The Kitchen are full of fresh new ideas today. 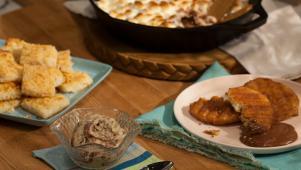 First, they fill the freezer with Jeff's make-ahead Sausage and Egg Muffins. Geoffrey shows viewers how to Conquer and Cook artichokes with his Artichoke and Shrimp Tagliatelle pasta. Plus, a look at the hottest new snacks popping up in bars across the country. 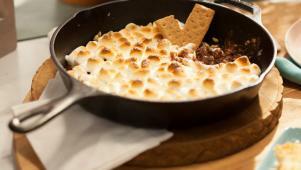 Jeff makes Skillet S'Mauros, his take on that campfire classic, s'mores. 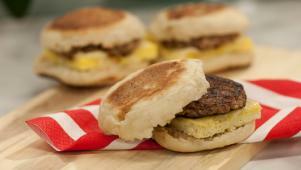 Sausage-and-Egg Jeffmuffins are freezable make-ahead breakfast sandwiches. 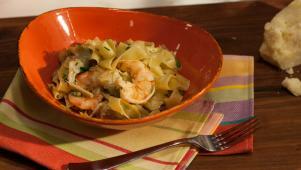 GZ makes an easy main dish of tagliatelle pasta with shrimp and artichokes. 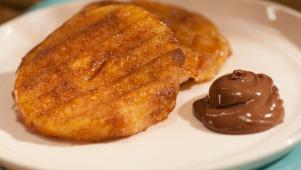 Katie presses day-old doughnuts in a panini grill for the sweetest snack.